Turkey is especially in the news with another bomb attack on Turkish soil, there have already been five in less than a year. Erdogan invariably blames it on 'Kurdish terrorists'. But it's obvious who benefits most from these mysterious attacks. Within the population in Turkey these attacks reinforce the feeling that only Erdogan's Justice and Development Party's (the AK Party) may bring back the relative calm in Turkey. Erdogan has already been re-elected for that reason. In order to expand his position of power Erdogan has suspended dialogue with the Kurdish PKK movement, and has started an internal war in southeastern Turkey. The army rushes with tanks through the narrow streets of the towns, terrorizing the population who had just begun to break down the walls of distrust between Kurdish and Turkish inhabitants, and small minorities such as the Armenians. In an editorial of February 18 The Guardian points out that Erdogan's political ambitions not only harm the interests of the United States, but also of Turkey itself. Facing the dangers that Erdogan sees in a Kurdish control of a strip of land in northern Syria near the Turkish border (Rojava), The Guardian says that the AK Party is itself co-responsible for this situation. In order to thwart its arch-enemy Assad of Syria, Turkey has allowed jihadist groups to cross the Turkish-Syrian border and has sponsored their campaign to overthrow the Assad regime: Ahrar al-Sham and Al-Nusra Front, both groups in Syria are linked to al-Qaeda. Erdogan, however, attributes the mysterious bombings not to those groups but to the Kurdistan Workers' Party (PKK) or its sister group in Syria, the Democratic Union party (PYD). Both organizations claim to no longer aim at creating an independent Kurdish state, but at integrating twenty million Kurds in the country through more political and cultural rights. The Guardian points out that, at the time, Erdogan argued that the PKK can not be defeated by military means and has called for negotiations and a permanent agreement with the Kurdish movement. The Guardian further argues that Turkey could also live with the rise of the PYD in Syria, namely in much the same way as it already does with the Iraqi Kurds under Barzani in their autonomous region. Turkey has strong ties with the Kurds in Iraq, based on mutual strategic and commercial interests (for example, exports of Iraqi oil via Turkey). Erdogan does not want peace with the PKK / PYD and is trying to obtain more presidential powers through a referendum. His hope is that the conflict with the PKK will increase the nationalistic mood and will give him the support he needs. Turkey's allies, including the USA, are exerting pressure on Erdogan behind the scenes to give up his personal ambitions. They point out that Turkey's support for the jihadists in Syria will harm the country in the long run much more than the PKK will ever be able to do. Are Erdogan's ambitions irresponsible? Yes, they certainly are for American imperialism. Are they harmful for the imperialist interests of Turkey as well? Perhaps, history will tell. We remember the political ambitions of George W. Bush. After numerous recounts of the votes he was elected president of the USA. To strengthen his position, Bush Jr. - after the 9/11 attacks by the former agent of the USA, Osama bin Laden - began a totally unjustified war in Iraq that eventually led to the breakup of the country. Erdogan repeats the enormous stupidity of Bush Jr. on a smaller scale. This shows once more that the chaos in which capitalism continues to sink for already 25 years is not the result of mistakes made by individual politicians, as The Guardian hypocritically suggests. The current bourgeois state politics and imperialist war are characterized by an extreme irrationality, because they are both the result of a capitalist society that has no future and that pushes humanity ever deeper into misery. Fredo Corvo Web Blog "Arbeidersstemmen", February 27, 2016. The army rushes with tanks through the narrow streets of the towns, terrorizing the population who had just begun to break down the walls of distrust between Kurdish and Turkish inhabitants, and small minorities such as the Armenians. That's still conjecture at this point. The PKK hasn't claimed it. Seems pretty clear to me, Flint. Even if the PKK do claim responsibility that does not preclude the involvement of the Turkish State or any other state for that matter. I don't see them claiming the bombing there, and I linked to a similar announcement about this formation earlier on libcom. Given the rushes to judgement in the last three Ankara bombings, I think its prudent to be patient and skeptical. Regardless of who did it, the state of Turkey will attack Bakur, Bashur and Rojava. Just like the last three bombings. Karasu, who is part of the central leadership talks about the target of the attack having been the riot police. Don't you think that that sort of suggests that they did it? If it had been done by a totally different organisation how would he have known that the target was the riot police seeing as according to all the reports I've seen there is no mention of any policemen being killed? Sorry, that was a slip of my finger. I thought I was on Google translate. I was chatting to my Syrian buddy on Facebook and he wrote 'fathia' which I do not know the meaning of. If you are still interested by the article, let me first elaborate further what the article tells about the ‘whodunit’. In most cases it is hard to find out what organisation was behind a terrorist attack. In those cases we can look at who’s gaining by the attack. In the case of the most recent bombings, I think Erdogan is gaining for reasons explained in the article. 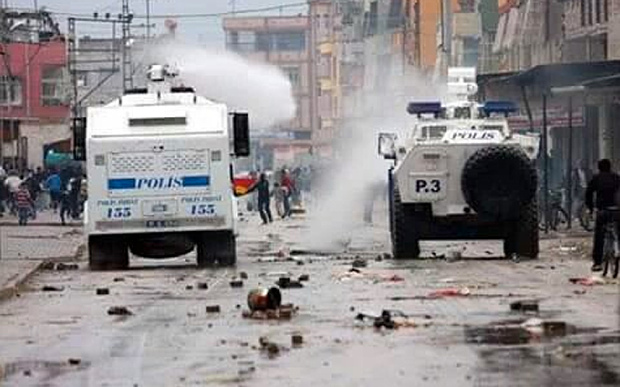 It cannot be excluded however that the PKK changed its tactics for several possible reasons. Furthermore, as the article explains bourgeois policy (that includes the PKK) has become more and more irrational in the sense of priority for short time considerations and even sheer individual aims. However, if we leave the terrain of speculation and the superficiality of daily events, we can see as a general tendency in all states and would-be states towards war and efforts to promote nationalism as to bind ‘their’ populations, and especially ‘their own’ working class to the state or would-be state. “Expansion of the workers' struggle over Turkey would not only jeopardise the Turkish participation in the war in Syria, but it would also be an example to follow for the workers in Iran, in Russia, in Europe. That's what all states, including the newly emerging ones, from the Kurdish State to Islamic State, are afraid of: that their "own" working class revolts against their exploiters and oppressors and unite in solidarity with their class brothers into one international struggle.